I keep the DKH up (~9-10) and all other parameters appear normal. Good water flow from three feet away, under 250 watt bulbs (9 months old). 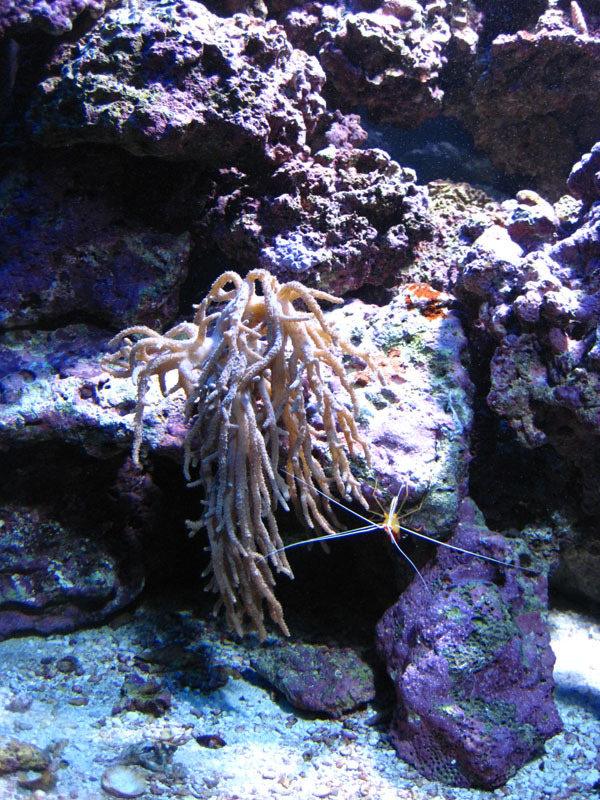 It extends its fingers and polyps are visible. I feed the tank twice a week with a stew of reef roids,mysis and live coral food. What other corals do you have in the tank? how many powerheads? how do you measure your salinity? some corals need varying, randome flow, and also salinity can play a role. if it's way off, the cells of the coral may either swell up excessivly or shrink, causing the coral to appear limp. The more details you can provide the better. I have 4 Koralia powerheads on a wavemaker. 2 @650 gal. and 2 @1050gal. which presents in a gentle flow throughout the tank (6 foot). Salinity is 1.025 which is a bit high but easily adjusted (tested with a vertex refractometer). The only other coral are a few mushrooms which are happy and about four feet away. 2 tangs one damsel,lots of coraline algae in a 8 year old tank ( starting into coral). Because my lamps are starting to age, I decided to put the leather higher up/closer to the light. We will see if that makes much difference-maybe in a couple days it will perk up. If it responds I will try placing it mid way to see if it droops again. Hoping santa brings tank lights this year! I started reading a book by Tony Calfo. One thing that interested me was a bit about over-extended polyps could be a sign of dirty lens/hood on halides. I am giving it a try. I removed the fixture and clean the lens covering the lights but notice that the lights themselves are looking frosted. Increased flow, increased lighting and increased dKH. We will have to wait a bit. I also read that they don't like to be moved around the tank. also in my tanks, leathers seemed to like the deeper side of the tank.. they wouldn't survive passed ~18" from the top. i had 400w's 10k and t5ho's actinics. they did quite well at 30~" from the top. mine also seem open alot more then the lights turned off in the evening and after feedings. pleased to report that the leather SLOWLY getting better-still extended "finger" but the main trunk system is becoming more erect and overall the size is increasing. Lotsa light and flow and frequent water changes (3X a week) with dKh boosted. Next weekend I will move it away from the light, then reduce water changes back to once a week later this month. I am so happy I am thinking of fragging it- maybe in the new year. to keep looking at them the way they did! so I took them out. him open up and look the way he does now,which is a very large leather!!! this is what happened to my leather though!!! in short........leathers are to have patience with. yep it sure is fussy! Yesterday is was all droopy-today it is happy again. I haven't moved it lower down in the tank- Worried it will collapse again over the Christmas holidays/partying here. Maybe in the new year I will get brave and try moving it.